This offer is an absolute Gift! Just in time for printing off Christmas labels and all #stationeryhounds, you’ll be surprised what you will start labelling next. Free local delivery to Gloucestershire, Monmouthshire, Herefordshire and as its nearly Christmas its very likely we wont charge anything for delivery in the rest of the UK – but please check first. For all of you who love Office Stationery and great writing pens, that are comfortable and easy to write with, then we’ve got a great offer on for you! 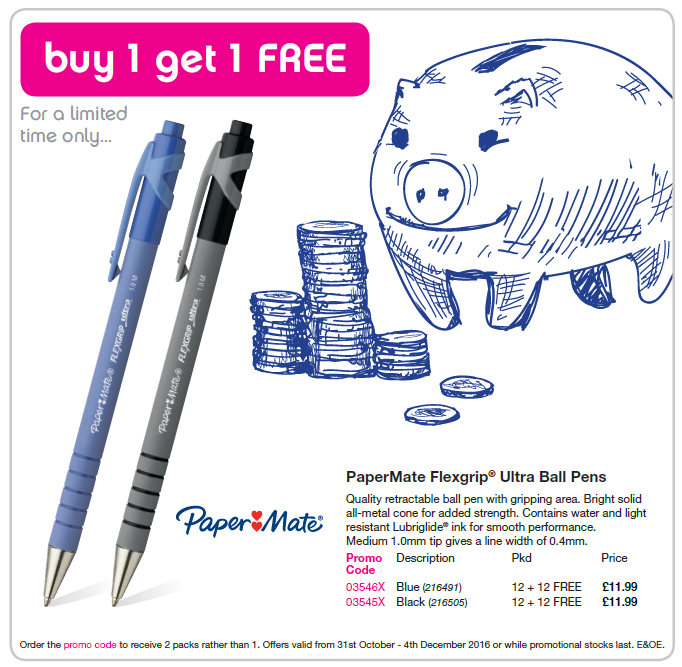 Buy one box of Papermate Flexigrip Pens in either blue or black and get another box absolutely FREE! And at only £11.99+vat per box whats there not to like! Free Local Delivery to Gloucestershire, Monmouthshire and Herefordshire. Contact our friendly team now on Tel 01594 810081 for further information.